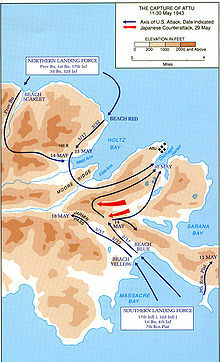 On 11 May 1943, units from 17th Infantry, of Maj. Gen. Albert Brown's 7th U.S. Infantry Division made amphibious landings on Attu ("Operation Landcrab" ) to retake the island from Japanese Imperial Army forces led by Colonel Yasuyo Yamasaki. 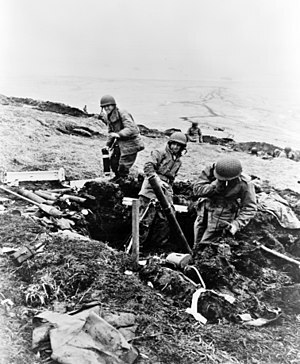 Despite heavy naval bombardments of Japanese positions, the American troops encountered strong entrenched defenses that made combat conditions tough. Arctic weather conditions and exposure-related injuries also caused numerous casualties among U.S. forces. After two weeks of relentless fighting, however, American units managed to push the Japanese defenders back to a pocket around Chichagof Harbor.